Flop of Northern Pass project raises a question: Is our energy plan being short-circuited? 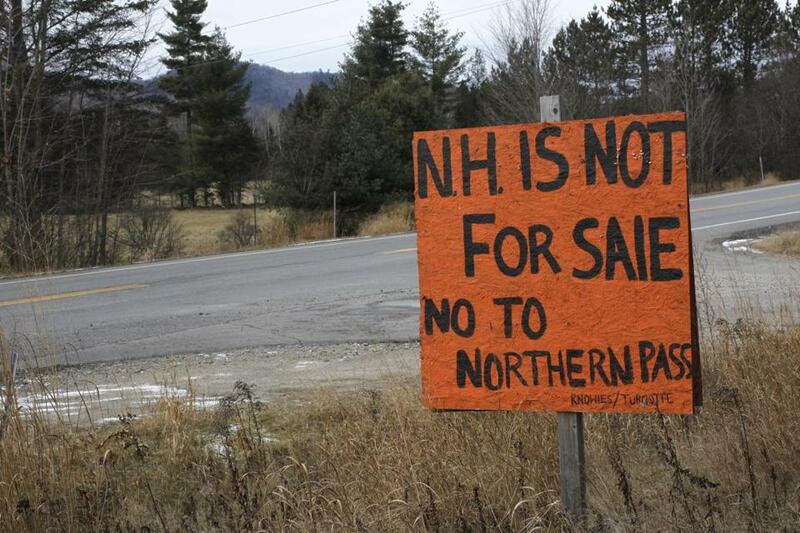 Opposition to the Northern Pass program has persisted for years — this photo was taken in 2012. Charlie Baker seems ready to bypass Northern Pass. But before we move on, the question remains: How did a bidding process overseen by the governor’s people pick a project that was dead on arrival? The administration enthusiastically endorsed a 192-mile transmission line from Canada as the best way to get clean electricity to Massachusetts, only for the project to be shot down a week later by New Hampshire regulators. The answer to how Northern Pass got short-circuited matters because the state has a similar process in place to procure offshore wind, with a winner to be selected in April. Baker will tell you the state’s commitment to reduce its reliance on oil and natural gas will require new production and transmission facilities. With that comes opposition from neighbors, environmentalists, and others. “Given that, no matter which project gets picked, there is going to be a tremendous amount of infrastructure associated with that,” Baker told reporters on Monday. Northern Pass — proposed by Eversource — would bring hydropower from Quebec through New Hampshire, including its famed White Mountain National Forest. No wonder the $1.6 billion project has caught the ire of environmentalists since it was proposed in 2010. Even so, the Baker administration believed that out of 46 bids, Northern Pass had the best chance to deliver the most electricity and at the earliest date. Yes, the opposition was loud, but that’s because the project has been around for a while; some of the other proposals were more nascent and perhaps hadn’t become contentious. It was a bad bet: The New Hampshire Site Evaluation Committee voted 7 to 0 against it. Who in Massachusetts made the brilliant decision that Northern Pass would be the best project for us? That would be the work of a review committee made up of about 40 people, including Judith Judson, commissioner of the state Department of Energy Resources, as well representatives from three utilities: Eversource, National Grid, and Unitil. Keep in mind that the Baker administration did not design the process; that was a 2016 state law requiring Massachusetts to procure large amounts of clean energy in order to decrease its reliance on fossil fuels. The committee used a scoring system to rank the bids. But the law gave utilities discretion to ultimately pick a winner, and if they could not reach a consensus, the Department of Energy Resources would break the tie. Was a consensus reached? State officials won’t say, citing confidentiality surrounding a state procurement process. More details will be submitted when the Department of Public Utilities reviews a completed contract. At this point, some of you may have already spotted the potential flaw in the process: How can the utilities act as both judge and jury? In other words, how can Eversource help select the winning bid yet also submit a bid? National Grid was also in the hunt with Granite State Power Link, which would take transmission lines through Vermont and New Hampshire to connect to wind power from Canada. If there was a deadlock among the utilities, could it be that each was fighting for its own lucrative project? When Beacon Hill crafted the legislation for such a massive clean energy procurement, Attorney General Maura Healey and the Conservation Law Foundation, among others, raised red flags about giving the utilities too much influence in the selection process. That’s why an independent evaluator was added, to monitor the committee. Healey’s office, which acts as the advocate for ratepayers, will also launch a review of the bidding, as required by law. It’s hard to imagine a scenario in which the state sticks with Northern Pass. Eversource plans to file a request for another hearing because the company believes New Hampshire ran a flawed process. But an appeal could delay the project and wipe away its time advantage. Eversource has spent at least $249 million so far on Northern Pass, from engineering to property purchases to marketing. If that kind of money can’t buy love in New Hampshire, I can’t imagine what would. After the New Hampshire rejection, Baker administration officials asked the utilities to quickly reassess whether Northern Pass remains the best option. Even this seemed problematic to Healey, who sent a letter on Tuesday to Judson, the energy commissioner, urging her not to let the utilities have the final say. Rather, Healey wants Judson’s department to be involved, under the watchful eye of the independent evaluator. The other elephant in the room is whether the fix was in for Eversource. The utility has always been wired into Beacon Hill, lining the campaign coffers of Republicans and Democrats alike. Eversource and its predecessors have contributed close to $100,000 to Baker and Lieutenant Governor Karyn Polito, according to state filings. From Baker’s perspective, at least New Hampshire didn’t leave us twisting in the wind. “At this point, there is actually good news in the fact that folks in the New Hampshire made a decision quickly, which then makes it possible for people to go back and consider our options,” the governor said. That’s true, too, and I’m confident the state will be able to move on. But what about the offshore wind procurement currently being evaluated with a similar setup with the utilities? The administration should consider revisiting the rules and prohibiting utilities on the review committee from being part of a bid, or utilities should recuse themselves if they are bidding. Otherwise, the state may find that it keeps giving too much power to the utilities.